EinsteinBut what if Einstein was not the first scientist to publish these famous equations? Should they be called, not the Einstein equations, but the Einstein-Hilbert equations, honoring also the German mathematician David Hilbert? In 1915, Einstein visited Hilbert in Gottingen, and Hilbert convinced him that the goal of a fully general relativistic theory was achievable, something Einstein had nearly convinced himself could not be done. 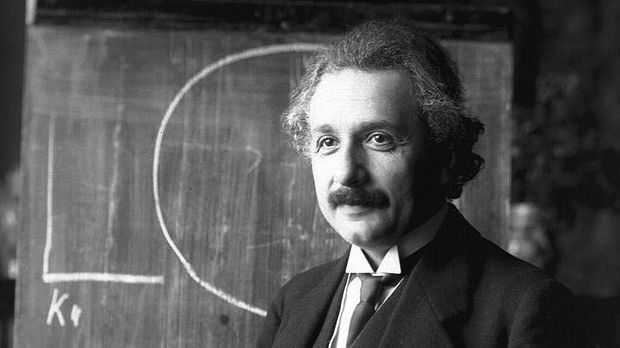 Einstein returned to work, and by November, he had found the field equations which give General Relativity its final form. However, Hilbert also worked on the ideas Einstein had discussed with him and published a paper discussing how Einstein’s theory fitted in with his own ideas on the role of mathematics in physics. The argument for honoring Hilbert lies in a paper written by him which included the Einstein equations, derived from fundamental principles. This paper, while appearing several months after Einstein’s, was submitted on November 20, and Hilbert even sent Einstein a copy which probably reached Einstein before he submitted his own paper. In fact, a few people have even gone so far as to propose that Einstein might have stolen the final form of his equations from Hilbert. Of course even if that were true, we are talking only about one final term in the equations (Einstein had published a close to correct version earlier in the month) and to Einstein would still belong sole credit for the enormous amount of work which went into the argument by which equations with these unique properties were singled out in the first place. We would still recognize Einstein for the critical physical thinking, while acknowledging Hilbert’s superior mathematical ability in more quickly finding the final correct form of the equations. Still, perhaps Hilbert would deserve a share of the credit for that final step. Why then do the centenary celebrations mention Einstein only and omit Hilbert almost completely? One reason is that in the late 1990s a historian working on Hilbert named Leo Corry made a remarkable discovery. He found a copy of the proofs of Hilbert’s paper, with a printers stamp dating it to December 6, 1915. These proofs show that Hilbert made significant changes to the paper after this date. In addition, the proofs do not contain the Einstein equations. The proofs have been cut up here and there (probably by the printers themselves as they worked), so it is possible that the equations would be there if we had the missing pieces. But it is also quite possible that amidst the changes Hilbert made to the paper, he took the opportunity to include the final form of the equations from Einstein’s paper. Indeed some of the changes he made after December 6 were to update his argument from earlier versions of Einstein’s theory to the later version. “There has been a certain resentment between us, the cause of which I do not want analyze any further. I have fought against the feeling of bitterness associated with it, and with complete success. I again think of you with undiminished kindness and I ask you to attempt the same with me. It is objectively a pity if two guys that have somewhat liberated themselves from this shabby world are not giving pleasure to each other.” (translated and quoted in Corry, Renn and Stachel, 1997). So if Einstein was becoming the new Newton, as the man who solved the riddle of gravity, he was far from being a new Newton in another sense; of being the sort of man who carries on scientific grudges to the detriment of his friendship with the other great thinkers of his day. Daniel Kennefick is associate professor of physics at the University of Arkansas, an editor of the Collected Papers of Albert Einstein, and the author of An Einstein Encyclopedia and Traveling at the Speed of Thought: Einstein and the Quest for Gravitational Waves (Princeton).